Our company is one of the most efficient and reliable companies which are deeply engaged in the line of manufacture, supply and export of one of the finest grade medicines and drugs for various kinds of disease treatments. 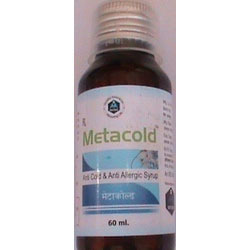 In the product range of our company are also included these anticold/ anti allergic cough syrups. 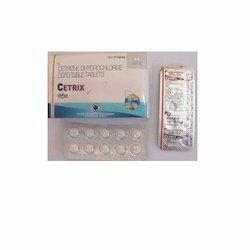 Being one of the most reliable and trusted companies in this line of work since past several years, we have also brought forth to our valued clients these supreme and finest quality Metacold Plus Tablets / Phenylepherine and Caffin Tablets. 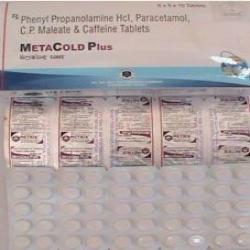 These metacold plus is basically used for the treatment of persons suffering with cold and cough in their respiratory system as well as cardiovascular systems. These metacold plus have been manufactured using supreme quality raw materials at our company. which we are also supplying and exporting over several different parts of the country as well as abroad. Looking for “Anticold Anti Allergic Cough Syrup”?